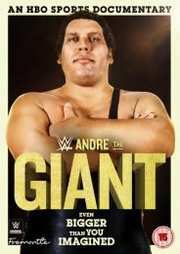 From HBO Sports, WWE, JMH Films and Ringer Films comes Andre The Giant, a documentary examining the life and career of one of the most beloved legends in WWE history. The ambitious, wide-ranging film explores Andre s upbringing in France, his celebrated WWE career and his forays into the entertainment world. It includes interviews with Vince McMahon, Hulk Hogan, Ric Flair, Arnold Schwarzenegger, Billy Crystal, Rob Reiner, family members and more. Plus includes some of Andre's greatest WWE matches including the WrestleMania Body Slam Match against Big John Stud, the legendary encounter with Hulk Hogan at WrestleMania 3, and more!